April | 2015 | Arthur in the Garden. 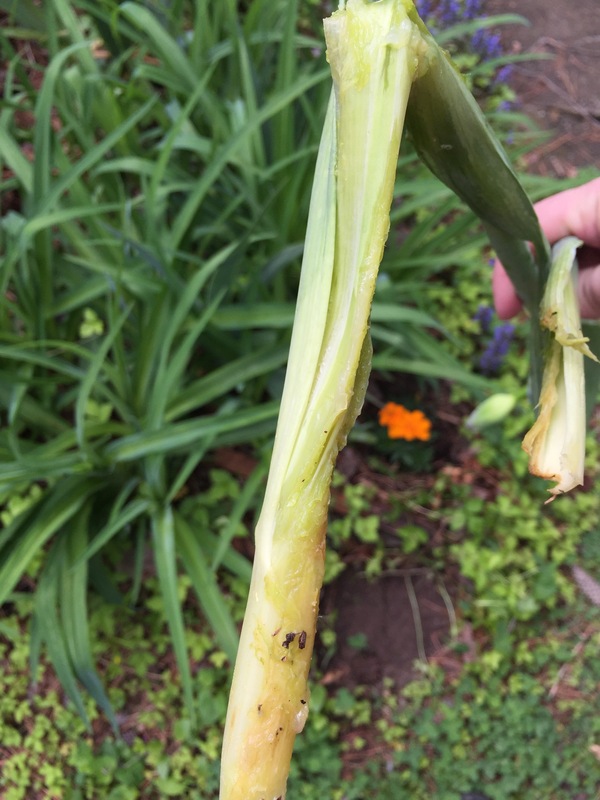 I was admiring the tall stalks of the German irises today and I found one which appeared to have broken at the base! This sometimes happens because they can grow as tall as 5 feet sometimes but not this one. Sometimes birds will attempt to perch on the very tallest of the four to five foot stems and in the process the buds will break but not the entire stem. Upon closer inspection I identify the offender! Iris borers! The stems had been eaten from the inside out and had a strong rotten smell. The moth lays eggs on the plant and upon hatching the larvae bore into the leaves and rhizomes eating away destroying the plant. Removing dead leaves in the Fall where the eggs are deposited and spraying in Spring are key preventative routines. Of course, I walk through the garden every morning so to have missed early signs means they must move fast! 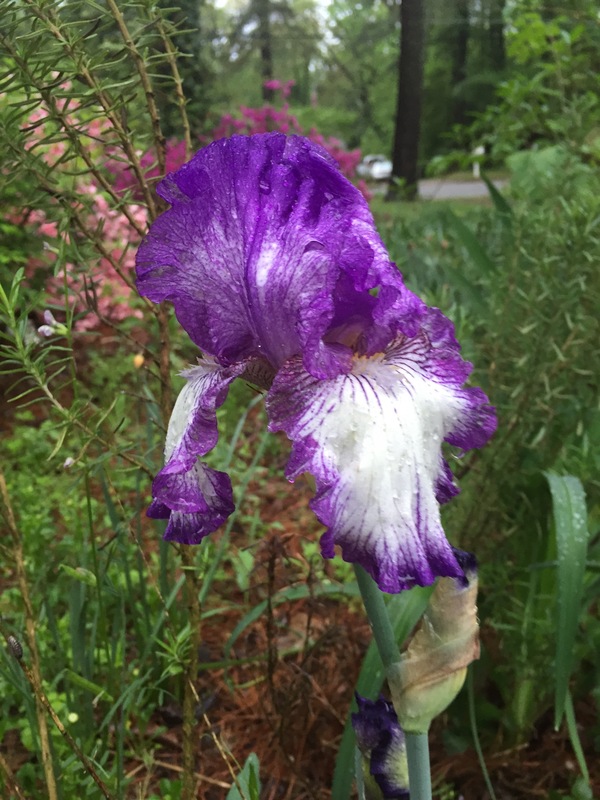 I sprayed all the iris plants with a “natural” spray in an attempt to stop any other borers in their tracks! About ten years ago I had two large loblolly pines removed which were in the bed along the front of the house. The arborist did that stump grinding thing which created very good soil. 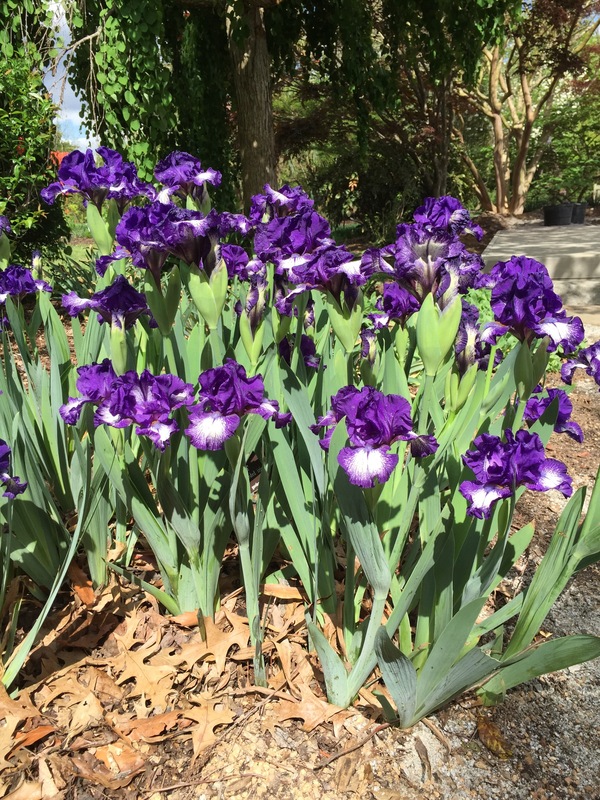 The bed made a perfect location for a bed of remonte (reblooming) irises! They were beautiful for several seasons until the iris borer moved in! The beds have recoved after keeping a vigilant eye and spraying an insecticide in the spring. The purples bloom first, than the yellow and Bronzes, and in May the white, immortality, is the last. They rest in the summer and usually produce another stalk in the Fall. 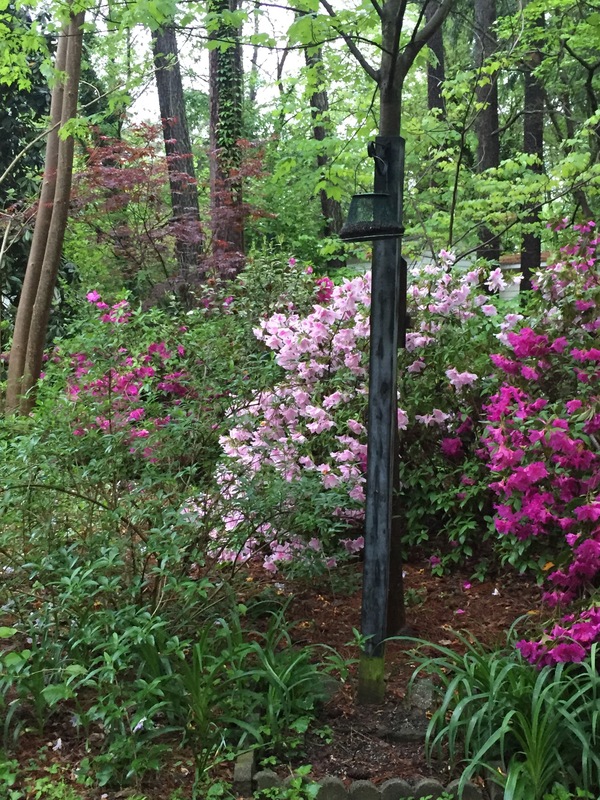 They azaleas continue to bloom as everything is greening up as the first leaves of Spring appear. 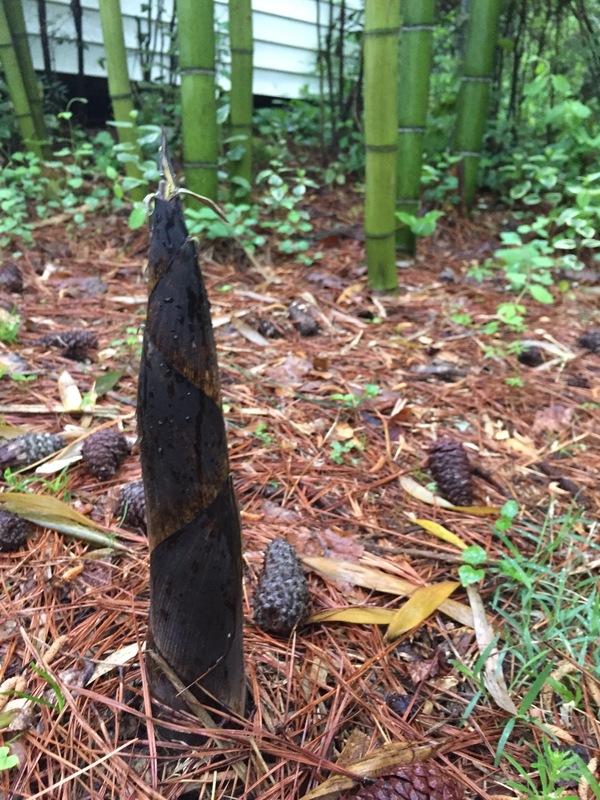 The timber bamboo is also growing new huge shoots (phyllostachys vivax). A sure signal that spring has arrived! 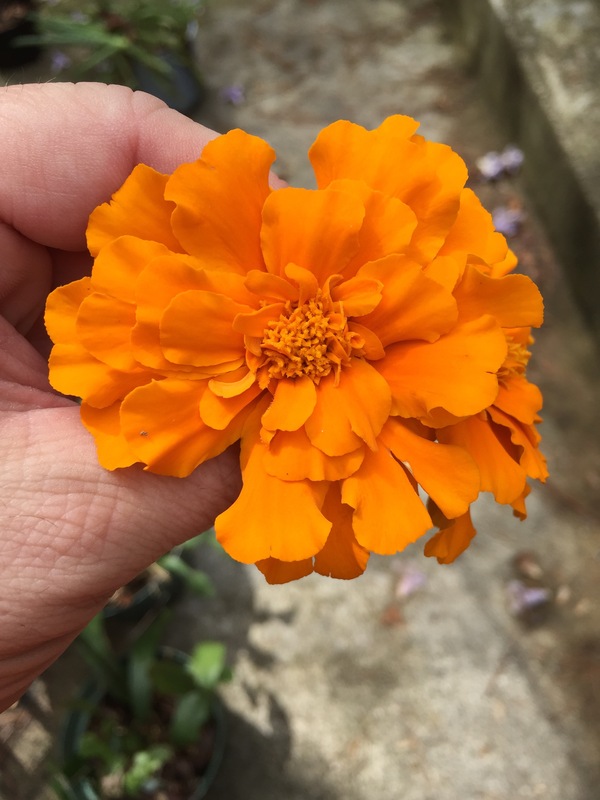 And I am totally in love with the new hybrid African-French marigolds! The flowers are huge! So much to keep me busy and generally out of trouble! Spring has sprung! Several weeks of warm weather has encouraged everything to grow! 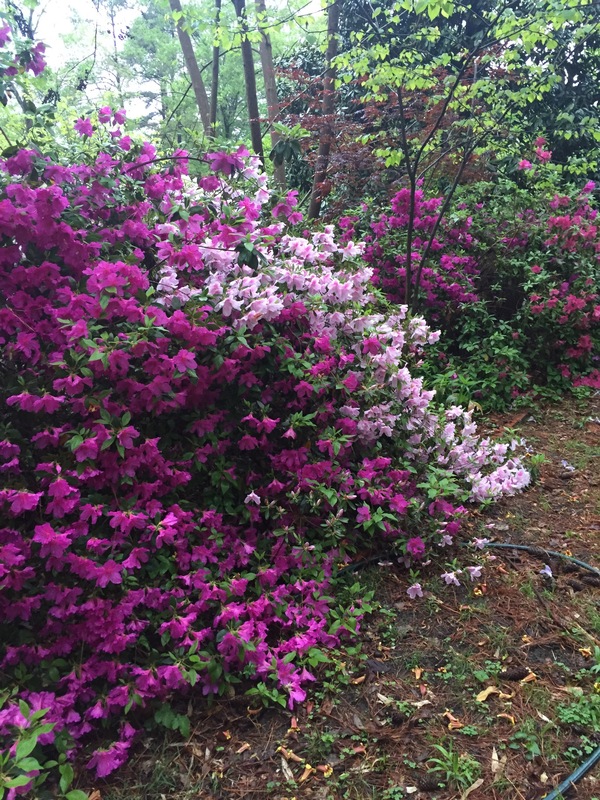 The azaleas are blooming and so many others! 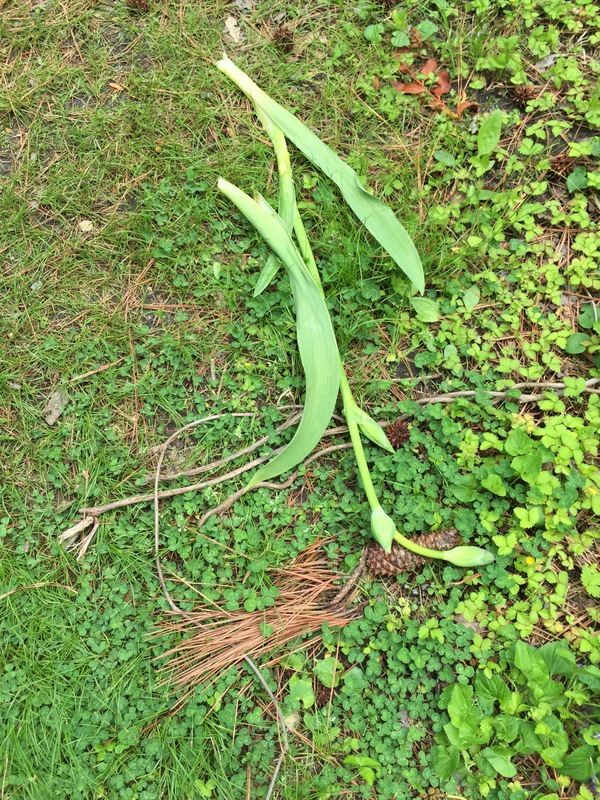 The perennials such as the day lilies are growing, too! On the South side of the front yard is the euonymus hedge with Keria and azaleas. Coral honeysuckle with a Kwanzan Cherry finishing it’s bloom in the background. When I purchased the house ten years ago I plant a few cross vines on two pine trees. They have covered the trunks but are so far up you can’t get a decent picture but the flowers fall to the ground as they age. On the left is Dragon Lady and on the right is Tangerine Dream. A few Scilla are still blooming but the wood phlox will hide their dying foliage as they go dormant. The light in the morning gave everything a chartreuse hue in the garden. And, of course, the typical Eastern Dogwood. I did breakdown and purchased a flat of marigolds although the slugs and rabbits love to eat them. I will have to spray them with a pepper spray or one of those deer or mole castor sprays! 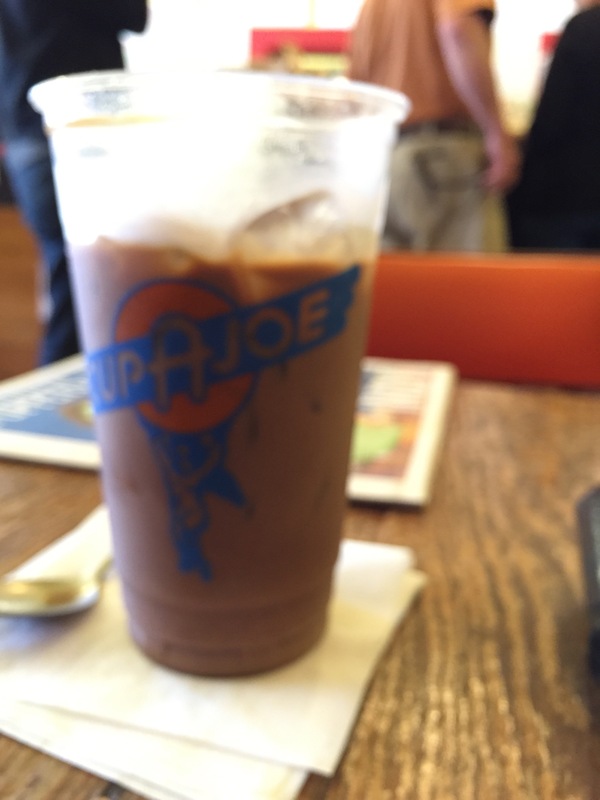 Tomorrow is another day…. to shop the plant dealers at The Farmer’s Market!